Why Did Dave Whitlock Move to Oklahoma? Dave moved to Oklahoma for several reasons but the lower Illinois River is one of them where he caught 17 varieties of fish in one day. 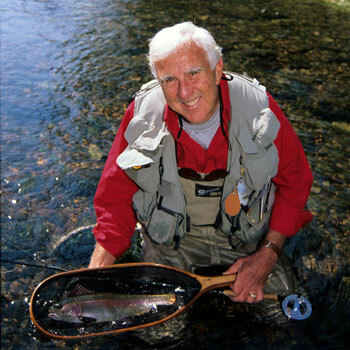 You won't want to miss this interview of one of fly fishing's most notable figures. At 73, Dave has been fly casting since he was nine years old. Although he came from a family of fishermen, they were more comfortable using crude tackle and cane poles. Little Dave wanted to try the real deal and talked his dad into buying him a 9 foot, 7 weight bamboo rod. You always remember your first rod, don’t you? Dave also remembers those early attempts at casting. “I guess probably I caught almost as many of them on my back cast and I did on my fore cast because I couldn’t cast very well at all. My back cast often hit the water behind me it really was a back cast more so than average I guess and I’d actually catch fish. I thought that was pretty cool catching fish on both directions.” From that moment on, Dave was (pardon the pun) hooked. If you’ve been fishing as long as Dave Whitlock has, then it’s a safe bet you’re going to have a treasure trove of great stories and favorite spots to fish. On the show, Dave recounts the day of his “grand slam” when he caught 17 varieties of fish in one day. This was up on the Illinois River which feeds into the Tenkiller reservoir. Below that dam, Dave found close to 8 miles of cold water fishing home to all kinds of species. Of course one of the things you’ve got to look out for fishing below a dam is when the water rises. Usually they’ll blow a loud whistle, but one time Dave got caught with his fishing buddy Billy and had to make a two mile sprint wading downstream to avoid the rising tides. A true test of endurance for any fisherman! Over the years, Dave has put his talent for fly tying and art to good work by publishing several books and magazine articles on the topic of fly fishing. One of his most popular volumes if the “Guide to Aquatic Trout Foods.” In that volume, Dave goes into great detail about the best way to lure a trout. According to Dave, the five key factors for what makes an effective fly are size, movement, texture, shape and color. If you’ve got the right material and the right pattern you can strike a balance between those factors to pull together a workable fly. Of course, you’ve got to know what you’re fishing for. A lot of warm and cool water fish have sensitive mouths. They’re not too keen on flies with hard bodies or a lot of epoxy. As Dave explains, “I like a fly that when they grab a hold of it, they feel like they got a bite of steak rather than a rock.” Perfect words of advice for the fly fisherman.